More than three million years ago, Nunavut's Ellesmere Island was a boreal forest anywhere from 14 to 22 C warmer than it is today. Scientists say it was also home to single-humped camels. Let's just put this out there: Camels used to live in Canada's High Arctic. It seems unlikely, but 3½ million years ago, Nunavut's Ellesmere Island was a totally different place. According to a group of scientists led by the Canadian Museum of Nature's Natalia Rybczynski, it was a boreal forest anywhere from 14 to 22 C warmer than it is today. It's hard to say whether or not the camels loved it up there. But why wouldn't they? The weather wasn't bad and there was plenty to eat. The remains were found in a fossil deposit called the Fyles Leaf Bed, after all. And for a vegetable muncher like the camel, Rybczynski's discovery of fossil leaves, wood and other plant material sounds like the perfect smorgasbord. And if eating a leaf and grass salad without relatives muscling in on your plate was top of list, well, this place fits the bill. The nearest known prehistoric camels before this find loped around in Yukon, 1,200 kilometres to the south. Rybczynski and her team — John Gosse from Dalhousie University in Halifax and Mike Buckley from the University of Manchester in England — authored a study on their find for the online journal Nature Communications. It took them three summer field seasons. Still, camels in the high Arctic. Unbelievable! Maybe the most unlikely part of this story is the evidence Rybczynski's team used to make their astounding claim. Check out the picture next to this paragraph. That's right. It's a miniature sandbox filled with 30 bone fragments. Camel bone fragments, mind you. So how do you build a 900-kilogram, 270-centimetre-tall at the shoulder dromedary (that's a one-humped camel, for your information) out of what looks like a sabre-toothed tiger's table scraps? Detailed digital scans of each of the shards allowed Rybczynski to piece them together and build a tibia. That's the big lower leg bone in all mammals. It was part of an animal that belonged to the order of artiodactyla. Those are cloven-hoofed animals like cows, pigs, giraffes, hippos — and camels. And then Buckley stepped in. He's developed an identification technique called "collagen fingerprinting." Collagen is the main protein in bones. He takes a bit, analyzes it and then he compares his findings to the collagen profiles of 37 modern mammals. Guess who matched up closest? It was our buddy's insatiable southern cousin, the Yukon Giant Camel. Rybczysnki is pretty excited about her discovery. "It's thrilling! It's absolutely thrilling! Because it's the first evidence of this type of animal. 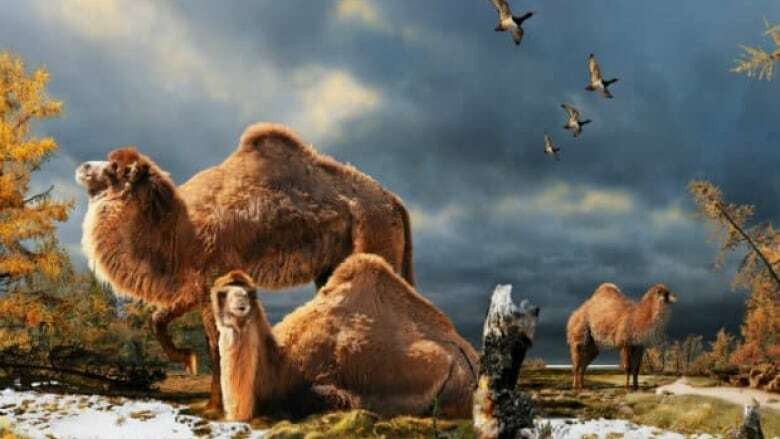 So we have a new animal for the assemblage that we know lived there at the time," she told the CBC, "and also of course, it's the first evidence we have that camels were living in this forest-type environment." Camels in the high Arctic. Awesome!